That’s it. There was no “worst of times”. Lucky me. But good times do not make good novelists, so fortunately I’m content to be a sometimes blogger. 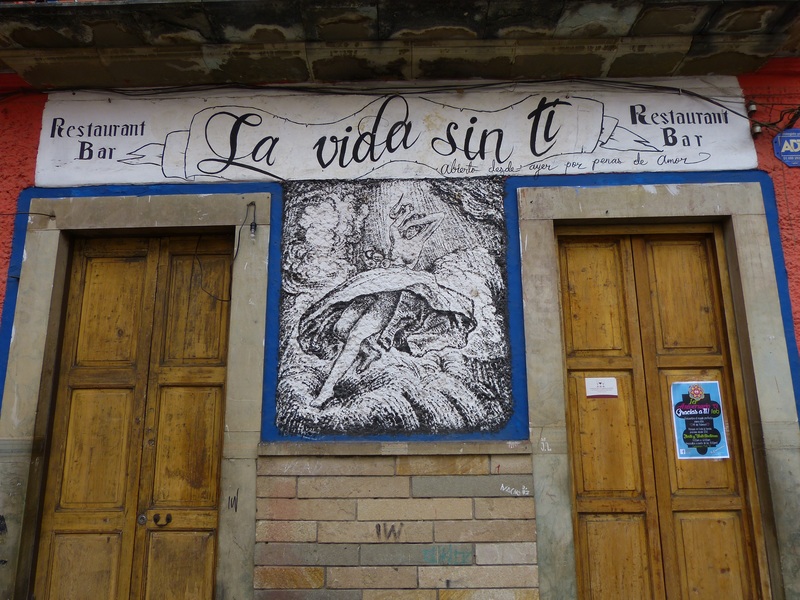 My other posts have all been about Querétaro, a delightful historic city–and I am far from done talking about it. But this post is about a SECOND undiscovered gem. Undiscovered by most USA tourists, that is. Global Volunteers are free on the weekend, so several of us took a bus to Guanajuato, a two and a half hour ride from Querétaro. And what a bus it was! I only wish airplane seats were so comfortable. Imagine being able to recline your seat without incurring the wrath of the person behind you. How about having a foot rest so you can stretch your legs out, just like you are in your favorite Lazy boy. Throw in free movies on your individual TV. Of course, you have to watch Renee Zellweger speaking Spanish, with her very full lips out of synch with her words. That’s the Premiera Plus ( the name of the bus company) experience. I preferred watching the countryside flash by, but that’s generally how I roll. Taxis to the historic center were plentiful and inexpensive — 50 pesos, or a little more than $3.00 –got us delivered to our hotel off La Plaza de La Paz. Check out my luxurious room. 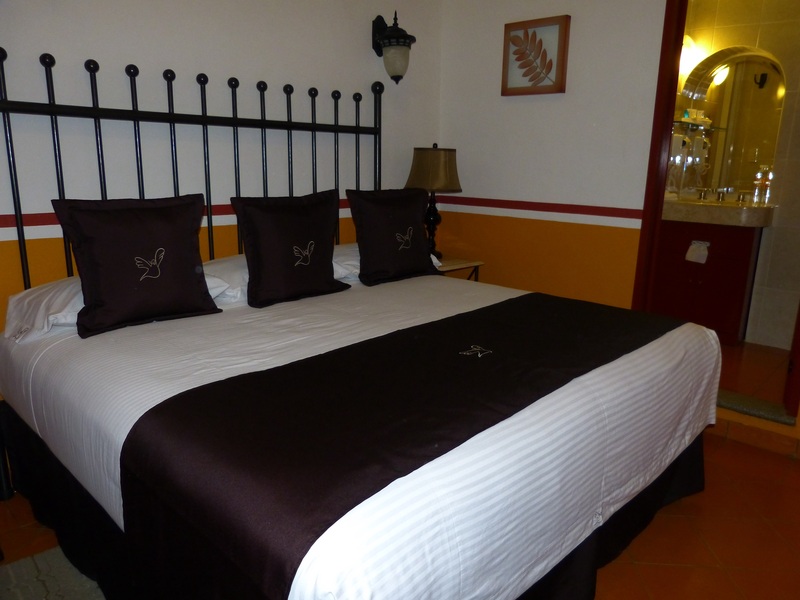 The bathroom was also beautiful–complete with hair dryer, and huge towels. Like Querétaro, Guanajuato is safe, clean, inexpensive, beautiful, friendly, musical, historic—AND it has a miradora–a panoramic view, something I can’t resist. I rode the funicular to the top of the hill, the site of the statue of el Pipila, who is clearly visible from just about everywhere in the city. Those so inclined can climb inside, sorta like the Statue of Liberty. I decided to take one for the team, so I climbed to the top, and I’m going to tell you–the view’s not worth it. 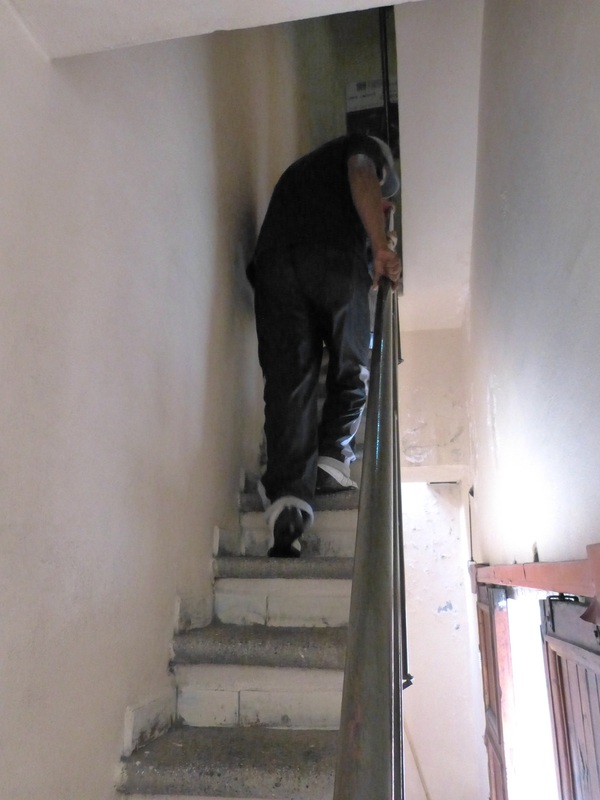 See how narrow the stairs are? The ladder to the top is even narrower, and just a tad scary. 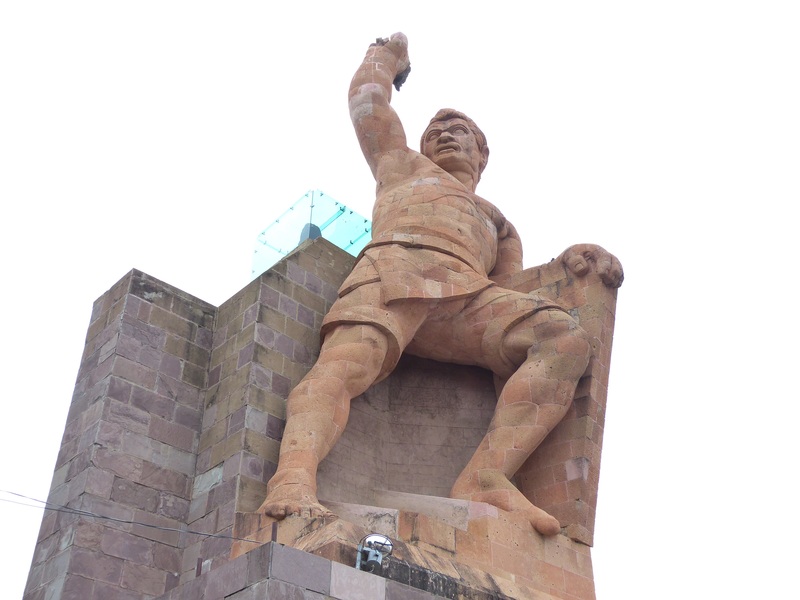 So, how did el Pipila get his very own statue at summit of Guanajuato? Are you getting tired of the history trivia? I hope not, because I’m going to tell you. El Pipila put a flat stone on his back to protect him from the Spaniards, who were holed up in a granary and tossing dreadful, dangerous things at him. He set fire to the door of the granary, which allowed the Mexicans to enter, slay with Spaniards and win the battle. Oh my God. Am I REALLY talking about battles and wars? Has it come to that? Guanajuato has an abundance of museums, and I was able to visit several of them. The things hanging on the walls were all very lovely, but what floats my boat are the buildings that house the exhibits. The Diego Riviera Museum is his childhood home. 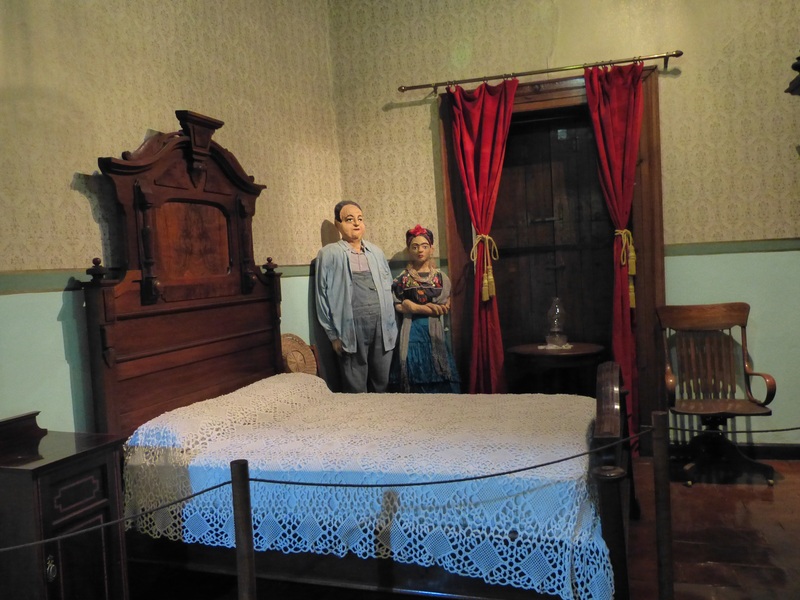 I don’t know whether he and Frieda actually slept there, but who cares? The architecture is fantastic, and the cutouts weren’t half bad. Guanajuato has its fair share of churches, and if there is a wedding happening, I never miss an opportunity to crash it. This lovely bride’s veil was pinned to her groom’s shoulder. After the ceremony was completed, they were unpinned. Don’t know the background, but I thought it was an interesting custom. 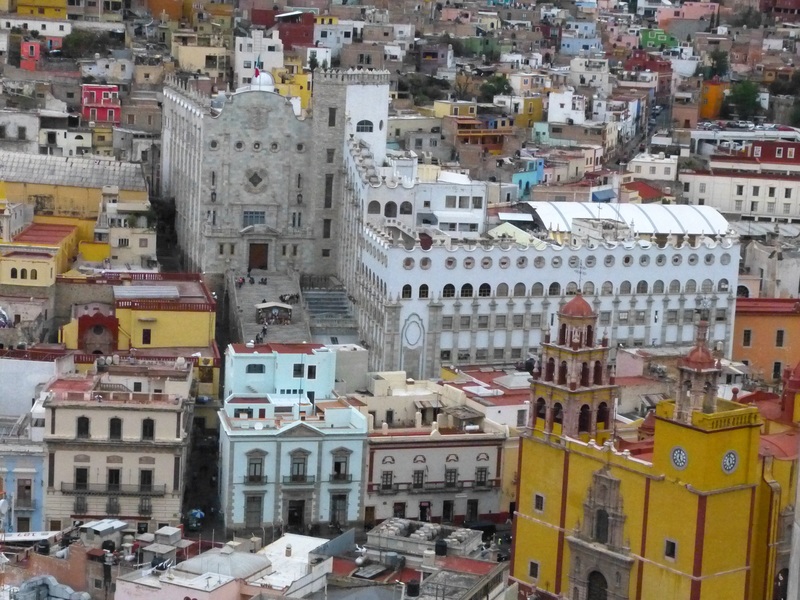 What else can I tell you about Guanajuato? The food was excellent. 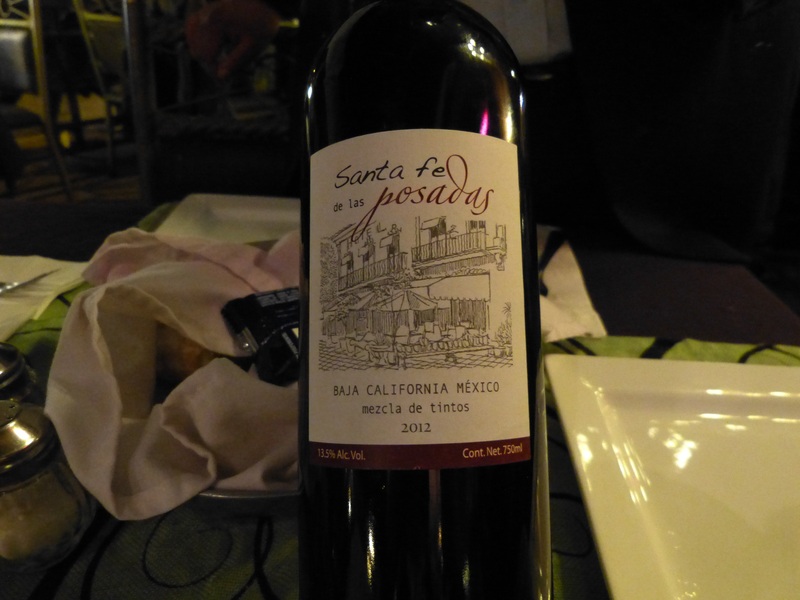 The Mexican wine was delicious, and of course I felt compelled to take photos of everything, so you can see for yourself. 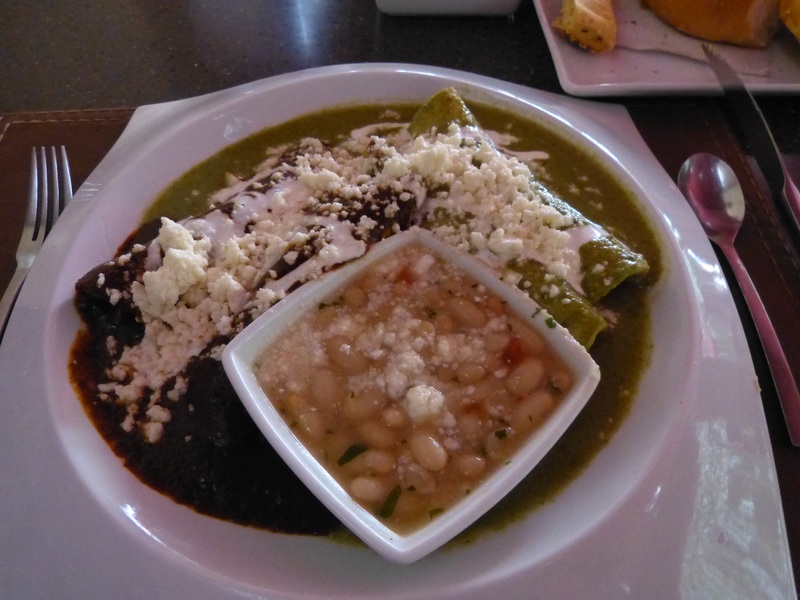 Enchiladas with mole (my guy’s favorite) and green sauce, with frijoles. 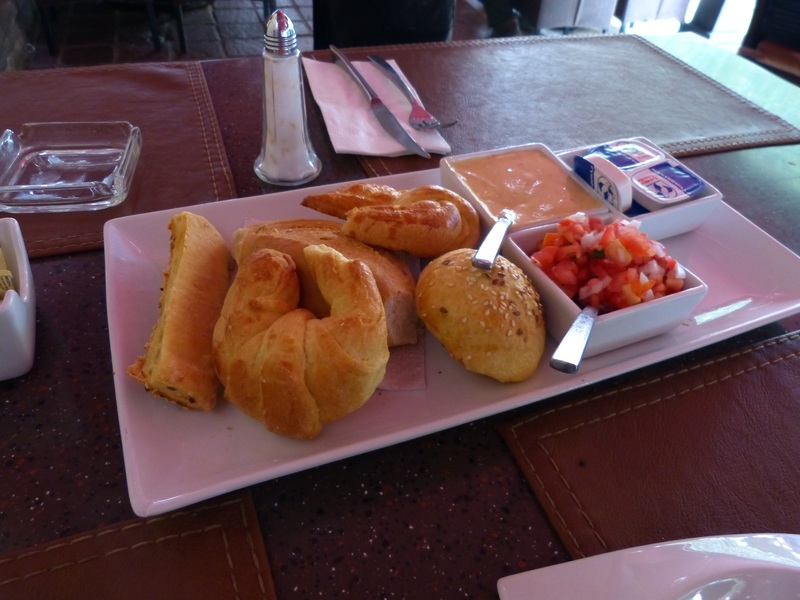 For less than $12…including that great bread and a cappuccino! Mexican wineries? Who knew their wine could be so delicious? I could keep posting photos till your eyes roll back into your heads. But I won’t. I’d encourage you to enjoy visiting this amazing city and will leave you with just two more photos. One of many bars in the town. 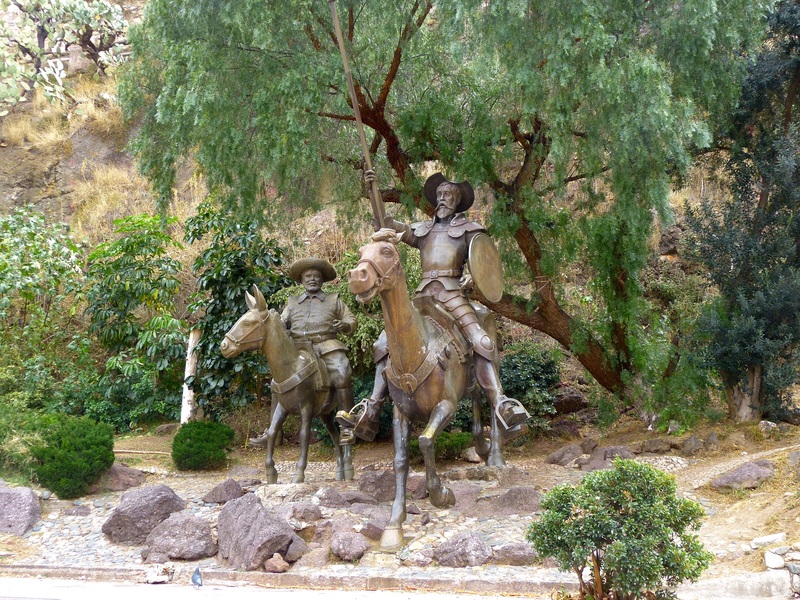 I’m not sure why Don Quixote is is so big in Guanajuato. That’s my assignment for my next visit. I’m almost out of power, so I’ll post. Please forgive the typos…drink a little wine, and this will all make sense to you. Visit this wonderful city and fall in love with it! Oh… I always suspected you were a wedding crasher …. and a crasher who takes great photos and tells a great story while samplin’ the wedding wine! This is so great!! I fear with all the healed-as-much-as-I’m-going-to aftereffects of my sports injuries, my remaining travel yearnings are going to stay just that, but I SO enjoy ‘vicarious’ trips and, fortunately have been enough places that your full descriptions and photos conjure smells, sounds and touches for me as well as filling my eyes. FYI for the future – whenever you ‘take one for the team’ climbing those stairs no one else will attempt, you tell them the view was THE MOST spectacular of the whole trip (and you were so smitten by looking that you forgot to photograph it for them). Another LAL! But does this mean that you will never again take another VBT trip? I have been hoping that we would both be pedaling our muscular butts all over some exotic location. Another winner, Shelley. You took me to the beautiful city with you. Thanks so much Janet. I’m glad you enjoyed traveling with me. I certainly love YOUR posts. I remain in awe of your discipline and your talent. Your poems were great! Next Next post: Happy Birth Month to You!